Dermoscopy (dermatoscopy, epiluminescence microscopy) is a noninvasive diagnostic technique for the in vivo observation of pigmented skin lesions (PSLs). This diagnostic tool permits the recognition of morphologic structures not visible by the naked eye, thus opening a new dimension in the analysis of the clinical morphologic features of PSLs. Due to the difficulty and variability of human interpretation, computerized analysis of dermoscopy images has become an important research area in the last years. Recently, numerous systems designed to provide computer-aided analysis of digital images have been reported in literature. The goal of this chapter is to focus on the most recent approaches based on content-based image retrieval systems (CBIR). This work was supported by a grant from FUTURA-onlus to A.B. and by a grant from Regione Lazio (Legge 598/94 grant MCC-1792) to Advanced Computer System. A.B., R.M., and E.D. are scientific advisers of Advanced Computer System. also known as query by image content (QBIC) and content-based visual information retrieval (CBVIR) is the application of computer vision techniques to the image retrieval problem, that is, the problem of searching for digital images in large databases. 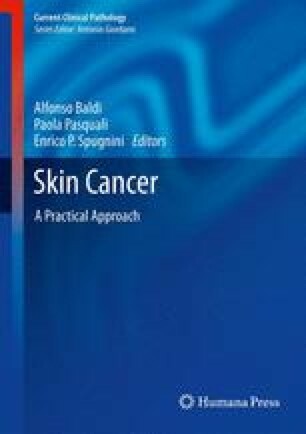 A noninvasive diagnostic technique for the early diagnosis of melanoma and the evaluation of other pigmented and nonpigmented lesions on the skin that are not as well seen with the unaided eye.